Afin de célébrer les mamans pendant cette journée, tous les magasins TEKOE leurs offrirons le dimanche 8 mai un thé à emporter. Il n’a y pas besoin de bon cadeau ou de code barre. En nous montrant (la photo de) vos enfants, vous recevrez un thé à emporter. Belle fête des mères ! Um alle Mütter während dieses Tages zu feiern, werden alle TEKOE Geschäfte am Sonntag 8. Mai den Mütter einen Tee zum Mitnehmen schenken. To honor all mothers, for this Mother’s day, we are offering a free takeaway at all Tekoe shops that open on Sunday, May 8th 2011. No coupon, no barcode: simply show us a photo of your beautiful child or your child to claim your free takeaway. 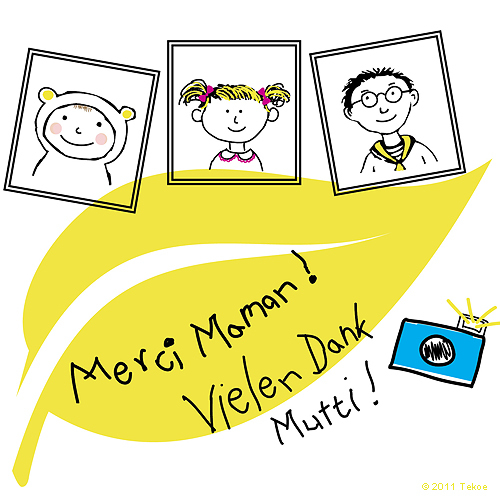 Happy Mother’s Day from Team Tekoe to all the mothers out there!